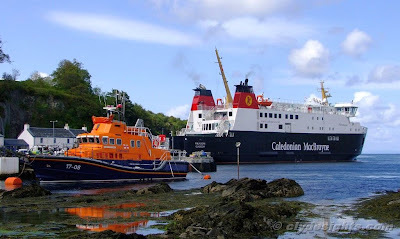 Although pictured a few days ago arriving at Oban, this view also shows the new CalMac ferry FINLAGGAN, this time alongside at Port Askaig on Islay. After her naming ceremony on Wednesday 25th May, she had been due to enter service the next day but unfortunately FINLAGGAN suffered a breakdown as she headed towards Port Askaig. Consequently, her entry into service was delayed until repairs had been carried out at Oban, and it was Wednesday 1st June before she was able to enter service. The Islay lifeboat, named HELMUT SCHRODER OF DUNLOSSIT II, dates from 1997 and is a member of the 'Severn' class. These 17 metre long all-weather boats have a range of around 250 miles, and a speed of 25 knots. Good to see you back ! !